Mr Cook graduated from the Royal Veterinary College (RVC) in London in 1977. He has worked in Louth since 1979 treating animals of all shapes and sizes. He has a keen interest in exotic work and has been known to have iguanas, parrots and even an alligator booked in to see him! He also works regularly with the local Seal Sanctuary and is involved with tagging seals for monitoring purposes. In his spare time he enjoys singing in the local choir, looking after his birds of prey and babysitting his grandchildren. Sophie graduated from Glasgow University in 2003. She came to Louth for her first job and, after meeting a local farmer, has never moved on. In 2010 she and her husband bought the practice from the previous owners, Mr Cook and Mr Timson, and aim to achieve the same quality service they have provided for years. In 2017 Sophie gained a Certificate in Small Animal Surgery, enabling the practice to carry out more advanced techniques. 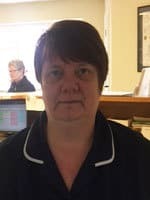 She keeps herself busy in her spare time by looking after her two sons, Andrew and Charles, walking her dogs, Ronnie, Gary and Reggie and riding her horse, Bertie. Andrew joined the practice in July 2015 after graduating from vet school in Slovakia. He already holds a degree in Equine Dentistry and as such has a keen interest in dental work in animals of all sizes, as Andrew has a variety of fancy fowl he is very interested in working with poultry and is also interested in exotic species working alongside Mr Cook. Andrew has a menagerie of animals at home: sheep, horses, dogs, chickens that keep him busy when he's not working. Andrew also became a daddy in January 2018 to Oscar. Naomi Van Hecke is our youngest vet at the moment and obtained her Masters Degree in July 2017 at the Faculty of Veterinary Medicine at the University of Ghent as a Companion Animal Vet. Naomi's hobby's are cooking and eating Belgian food like: Belgisch stoofvlees met Belgische frietjes, witloof met kaas en hesp in de oven, Belgische vol au vent, peekesstoemp met boerenworst, koffiekoeken, Belgische wafels, mosselen op mijn tantes wijze, all deserts with Belgische chocolade and of course so many more. If she still has any spare time left she loves watching animals and learning their behaviour and movements. 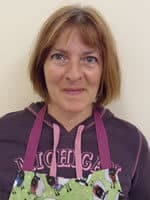 Louise graduated from the University of Liverpool in July 1992, Louise has an interest in dermatology, chronic pain management and acupuncture. When not treating small animals, she loves to walk, spend time with her family, work in her garden and thoughly enjoys her Lincoln Red Cattle. Sarah qualified as a veterinary nurse in 2003 but has worked in the practice since leaving school. As Head Nurse, she runs an excellent team and keeps the practice spotless despite the vets' best attempts to make a mess! In her spare time, she enjoys walking her beloved Labrador, Ryan. Katrina joined the practice in 2004 and qualified as a veterinary nurse in 2009. Katrina is one of our clinical coaches for veterinary nurse trainees. In her spare time she enjoys riding her horse Breezer and also enjoys being with her husband James and son Aaron and Oliver the cat. 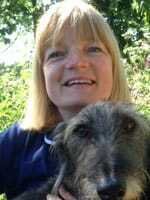 Clare qualified as a veterinary nurse in 1997 and worked in veterinary practices down south before settling down in Lincolnshire to raise a family. 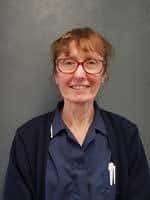 She joined the practice in February 2015 and has proved herself to be an asset to the nursing team. In her spare time, she enjoys spending time with her two daughters and looking after her pet rats. Harriet qualified as a veterinary nurse in 2017. 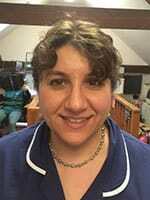 Harriet has been at James Street since December 2014, she is an extremely enthusiastic member of the team and is very keen to improve her knowledge and techniques, putting them all together to promote our veterinary nurse clinics. In her spare time, she enjoys riding her horse Blaze and walking Herbie the Basset Hound and Scooby a Bullmastiff. Natalie is a student veterinary nurse, completing her second year in July 2018. She has previously worked with a variety of animals and in an enthusiastic and cheerful member of our team. In her spare time she enjoys spending time on the family run farm with her partner Jack and son Oliver - not forgetting her Dalmatian Dougie! As our practice manager, Heather has a hard task trying to keep us all under control. In 2010 she completed a qualification in accountancy which she uses to keep all the practice and client accounts in order, however she also oversees the day-to-day running of the practice and there isn't much going on that she doesn't know about! In her spare time she enjoys training her gundogs and spending time with her grandchildren. Cathy, Rachel, Jo and June are always happy to help with any queries or assist our clients in any way they can. Manning the desk can be a stressful experience at times with a busy surgery and even busier phones but they always do their best to have a smile and a welcome for every client that comes through the door. Lorraine, our cleaner, does her best to keep the reception area ship-shape and always has a friendly smile to lift everybody's mood.